Home automation. A reality check. Home automation is much in the news at the moment now that companies are making the chips-with-everything kit and the various apps. The chips-with-everything lifestyle is almost inevitable. Almost everything can be improved by adding some intelligence to it, and since the intelligence will be cheap to make, we will take advantage of this potential. In fact, smart ways of doing things are often cheaper than dumb ways, a smart door lock may be much cheaper than a complex key based lock. A chip is often cheaper than dumb electronics or electromechanics. However, electronics no longer has a monopoly of chip technology. Some new chips incorporate tiny electromechanical or electrochemical devices to do jobs that used to be done by more expensive electronics. Chips now have the ability to analyse chemicals, biological matter or information. They are at home processing both atoms and bits. These new families of chips have many possible uses, but since they are relatively new, most are probably still beyond our imagination. We already have seen the massive impact of chips that can do information processing. We have much less intuition regarding the impact in the physical world. 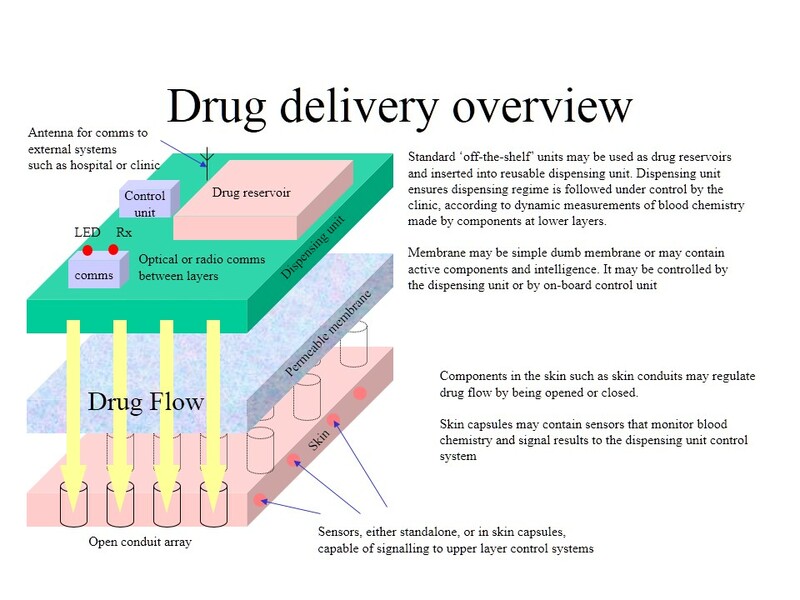 Some have components that act as tiny pumps to allow drugs to be dispensed at exactly the right rate. Others have tiny mirrors that can control laser beams to make video displays. Gene chips have now been built that can identify the presence of many different genes, allowing applications from rapid identification to estimation of life expectancy for insurance reasons. (They are primarily being use to tell whether people have a genetic disorder so that their treatment can be determined correctly). It is easy to predict some of the uses such future chips might have around the home and office, especially when they become disposably cheap. Chips on fruit that respond to various gases may warn when the fruit is at its best and when it should be disposed of. Other foods might have electronic use-by dates that sound an alarm each time the cupboard or fridge is opened close to the end of their life. Other chips may detect the presence of moulds or harmful bacteria. Packaging chips may have embedded cooking instructions that communicate directly with the microwave, or may contain real-time recipes that appear on the kitchen terminal and tell the chef exactly what to do, and when. They might know what other foodstuffs are available in the kitchen, or whether they are in stock locally and at what price. Of course, these chips could also contain pricing and other information for use by the shops themselves, replacing bar codes and the like and allowing the customer just to put all the products in a smart trolley and walk out, debiting their account automatically. Chips on foods might react when the foods are in close proximity, warning the owner that there may be odour contamination, or that these two could be combined well to make a particularly pleasant dish. Cooking by numbers. In short, the kitchen could be a techno-utopia or nightmare depending on taste. Mechanical switches can already be replaced by simple sensors that switch on the lights when a hand is waved nearby, or when someone enters a room. In future, switches of all kinds may be rather more emotional, glowing, changing colour or shape, trying to escape, or making a noise when a hand gets near to make them easier or more fun to use. They may respond to gestures or voice commands, or eventually infer what they are to do from something they pick up in conversation. Intelligent emotional objects may become very commonplace. Many devices will act differently according to the person making the transaction. A security device will allow one person entry, while phoning the police when someone else calls if they are a known burglar. Others may receive a welcome message or be put in videophone contact with a resident, either in the house or away. It will be possible to burglar proof devices by registering them in a home. They could continue to work while they are near various other fixed devices, maybe in the walls, but won’t work when removed. Moving home would still be possible by broadcasting a digitally signed message to the chips. Air quality may be continuously analysed by chips, which would alert to dangers such as carbon monoxide, or excessive radiation, and these may also monitor for the presence of bacteria or viruses or just pollen. They may be integrated into a home health system which monitors our wellbeing on a variety of fronts, watching for stress, diseases, checking our blood pressure, fitness and so on. These can all be unobtrusively monitored. The ultimate nightmare might be that our fridge would refuse to let us have any chocolate until the chips in our trainers have confirmed that we have done our exercise for the day. Some chips in our home would be mobile, in robots, and would have a wide range of jobs from cleaning and tidying to looking after the plants. Sensors in the soil in a plant pot could tell the robot exactly how much water and food the plant needs. The plant may even be monitored by sensors on the stem or leaves. The global positioning system allows chips to know almost exactly where they are outside, and in-building positioning systems could allow positioning down to millimetres. Position dependent behaviour will therefore be commonplace. Similarly, events can be timed to the precision of atomic clock broadcasts. Response can be super-intelligent, adjusting appropriately for time, place, person, social circumstances, environmental conditions, anything that can be observed by any sort of sensor or predicted by any sort of algorithm. With this enormous versatility, it is very hard to think of anything where some sort of chip could not make an improvement. The ubiquity of the chip will depend on how fast costs fall and how valuable a task is, but we will eventually have chips with everything. So that was what was pretty everyday thinking in the IT industry in 2000. The articles I’ve read recently mostly aren’t all that different. What has changed since is that companies trying to progress it are adding new layers of value-skimming. In my view some at least are big steps backwards. Let’s look at a couple. Networking the home is fine, but doing so so that you can remotely adjust the temperature across the network or run a bath from the office is utterly pointless. It adds the extra inconvenience of having to remember access details to an account, regularly updating security details, and having to recover when the company running it loses all your data to a hacker, all for virtually no benefit. Monitoring what the user does and sending the data back to the supplier company so that they can use it for targeted ads is another huge step backwards. Advertising is already at the top of the list of things we already have quite enough. We need more resources, more food supply, more energy, more of a lot of stuff. More advertising we can do without. It adds costs to everything and wastes our time, without giving anything back. If a company sells home automation stuff and wants to collect the data on how I use it, and sell that on to others directly or via advertising services, it will sit on their shelf. I will not buy it, and neither will most other people. Collecting the data may be very useful, but I want to keep it, and I don’t want others to have access to it. I want to pay once, and then own it outright with full and exclusive control and data access. I do not want to have to create any online accounts, not have to worry about network security or privacy, not have to download frequent software updates, not have any company nosing into my household and absolutely definitely no adverts. Another is to migrate interfaces for things onto our smartphones or tablets. I have no objection to having that as an optional feature, but I want to retain a full physical switch or control. For several years in BT, I lived in an office with a light that was controlled by a remote control, with no other switch. The remote control had dozens of buttons, yet all it did was turn the light on or off. I don’t want to have to look for a remote control or my phone or tablet in order to turn on a light or adjust temperature. I would much prefer a traditional light switch and thermostat. If they communicate by radio, I don’t care, but they do need to be physically present in the same place all the time. Automated lights that go on and off as people enter or leave a room are also a step backwards. I have fallen victim once to one in a work toilet. If you sit still for a couple of minutes, they switch the lights off. That really is not welcome in an internal toilet with no windows. The traditional way of running a house is not so demanding that we need a lot of assistance anyway. It really isn’t. I only spend a few seconds every day turning lights on and off or adjusting temperature. It would take longer than that on average to maintain apps to do it automatically. As for saving energy by turning heating on and off all the time, I think that is over-valued as a feature too. The air in a house doesn’t take much heat and if the building cools down, it takes a lot to get it back up again. That actually makes more strain on a boiler than running at a relatively constant low output. If the boiler and pumps have to work harder more often, they are likely to last less time, and savings would be eradicated. So, all in all, while I can certainly see merits in adding chips to all sorts of stuff, I think their merits in home automation is being grossly overstated in the current media enthusiasm, and the downside being far too much ignored. Yes you can, but most people won’t want to and those who do probably won’t want to do nearly as much as is being suggested, and even those won’t want all the pain of doing so via service providers adding unnecessary layers or misusing their data. This entry only makes sense if you read the previous two parts! if you have looked at them, time to read this one. Remember, this is onl;y a list of the ideas we had way back in 2001, I haven’t listed any we invented since. A multilevel device architecture with some of the layers in or on the body, working in conjunction. Sub-surface imprints that monitor various body state parameters, such as chemical, electrical, temperature, and signal this information to higher layer devices. This layer has by far the most opportunities since it is not restricted to materials that can be tolerated in the body, and can also use a factory pre-printed membrane that can be transferred onto the skin. It can encompass a wide range of devices that can be miniaturised sufficiently to fit in a thin flexible package. Many currently wearable devices such as phones and computers could end up in this layer in a few years. Most of the mid-term and some of the tattoo layer devices are also appropriate at this layer. Actuators built into membrane, allows program interface and force feedback systems, drug dosing, skin tensioning etc, use for training and games, sports, immersive environments etc. This layer is occupied by relatively conventional devices. There are no obviously lucrative technologies suggested for this layer. Taking another angle of view, the above applications and platforms yield 28 very promising inventions. In most cases, although humans are assumed to be the users, other animals, plants, inorganic objects such as robots or other machines, and even simple dumb objects may be targets in some cases. *Asterixes indicate reference to another area from this set. Sub-skin-surface imprints and implants that monitor various body state parameters, such as chemical, electrical, temperature, and signal this information to higher layer devices. Circuitry is imprinted into the skin using ink-jet technology or high pressure diffusion. e.g. a hand may be inserted into a print chamber, or a print device may be held in contact with the required area. Other small encapsulated components such as skin capsules* may be injected using high pressure air bursts. Some of the circuit components assembled in situ may require high temperatures for a short time, but this would cause only momentary pain. Deeper implants may be injected directly into the required position using needles or intravenous injection, allowing later transport to the required location in the blood flow. The implants may anchor themselves in position by mechanical or magnetic means, their positioning determined in co-operation with higher layer devices. Patterns implanted may be used as part of an external system. An ink-based pattern could be used as an identifier, for holding data, or as a means of positioning. They may be used as part of a, which would effectively be enhanced biometric security system. Circuitry or patterns may be harmlessly biodegradable so that it would vanish over time, or may be permanent. Inks may be used that are rewritable, e.g. they change their colour when exposed to UV or a magnetic field, so data may be modified, and these devices are therefore dynamic data storage devices. They need not operate in the visible spectrum, since external sensors are not limited by human characteristics. 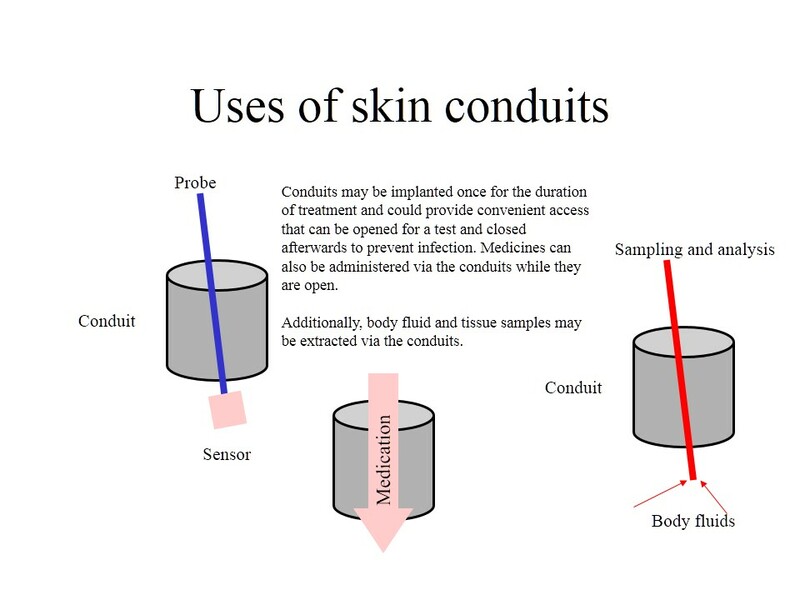 Devices may be implanted that are able to act as a conduit to lower skin layers. 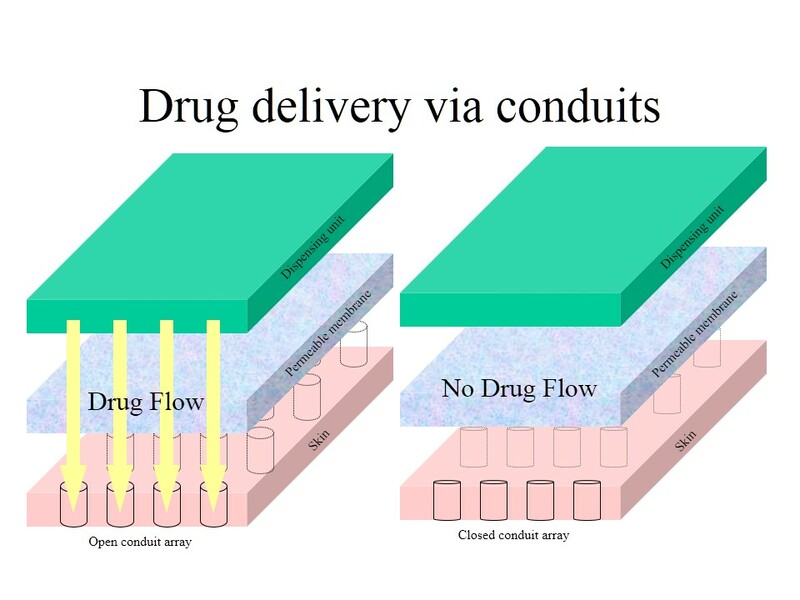 This may facilitate drug delivery, monitoring or nerve connection. Probes of various types may be inserted through the conduits for a variety of medical or interface reasons. Even body fluids and DNA samples may be extracted via these conduits. Conduits would be sealed to prevent bacterial or viral entry except when actively in use. The conduits can be implemented in several ways: tubes may be implanted that have muscle wires arranged so that when they contract the holes flatten and thus close; the walls of the tube may be comprised of magnetic materials so can be closed magnetically; the default position may be closed and magnetic repulsion is used to stretch the holes open; similarly, muscle wire may be used to open the holes by rounding a previously flattened hole; the open or closed states can be provided by elongating or shortening a tube; heat may be used to cause expansion or contraction; synthesised muscle tissue may be used to stretch the area and make holes open; shape change and memory metals or plastics may be used. Other techniques may be possible. 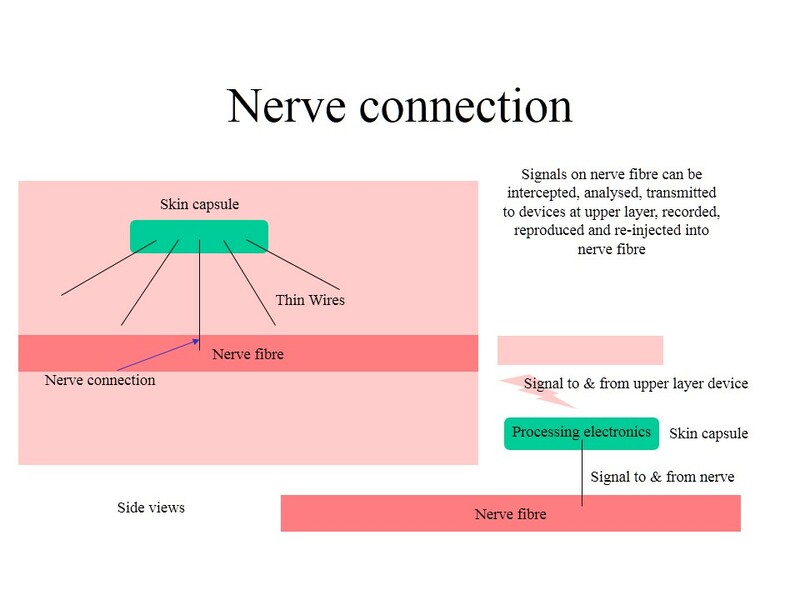 Permanently imprinted circuitry to link to nerves would comprise electrical connections to nerves nearby, by means of conducting wires between nerves and the devices. The devices meanwhile would be in communication with the higher layers. They would signal impulses to higher layers and capable of producing impulses in various patterns into the nerves. The connections would be made using specialised skin capsules* or directly injected wires. These devices would encapsulate very thin wires that propagate out from the device on request until they make electrical contact with a suitable nerve. They may be wound in a spiral pattern inside the capsules and unwound to form radiating wires. Email or other communications could include instructions that translate into nerve stimuli in the recipient. This may link to emotional stimulation too. A very rich form of intimate communication could thus be achieved. A range of sensors may be implanted that are sensitive to various forms of radiation, EM, magnetic fields, electrical fields, nuclear radiation or heat. These would form part of an augmented sensory system. Conventional technology based radiation monitors worn on a detachable layer may monitor cumulative radiation dose, or record intensity over time. Other conventional technology sensors may also be worn at the detachable layer, some my be imprinted or implanted. They may be connected systemically with the nervous system using implanted or imprinted nerve links* to create nerve stimuli related to sensor activity. An array of synthetic senses may thus be created that would facilitate operation in a range of environments and applications. A primary market would be for sexual use, where sexual stimulation can be produced remotely directly into the nervous system. Nerve stimuli could be amplified to increase sensory sensitivity. Alternatively, stimuli could be translated into vibration, heat, pain, other tactile stimulus, or audio that would be picked up by the body more easily than the original form. Such sensory enhancement may be used to link stimuli in different people, or to link people with real or virtual objects. When connected to deep implants in the brain, this could perhaps eventually be used to implement crude telepathic communication via a network. Remote control of robotics or other external machinery may be facilitated by means of linking sensory stimuli directly to machine operations or sensors. The communication would be via implanted or imprinted antennae. Sensors in or on the skin may be used to initiate external alarms or to initiate corrective action. For example, an old person taking a shower may not realise the water temperature is too high, but the sensors could detect this and signal to the shower control system. The most useful implementation of this would be one or more thermocouples or infrared sensors implanted in the skin at or near areas most likely to be exposed first to hot water such as hands or feet. Thermal membranes that change conductivity according to temperature could be used as a transfer layer device. As well as signalling to external systems, these sensors will use implanted or imprinted nerve links* to initiate direct local sensory stimulation by means of vibration* or pain enhancement, or produce audible warnings. Alarms may also be triggered by the position of the person. A warning may be set up by interaction of the implant and external devices. A circuit in the skin can be detected by an external monitor, and warn that the person is moving into a particular area. This may be used to set off an alarm or alert either secretly or to the knowledge of the either only the person or only the external system. This can obviously be used to police criminals on parole in much the same way as existing tags, except that the technology would be less visible, and could potentially cause a sensation or even pain directly in the criminal. A virtual prison could be thus set up, with it being painful to leave the confines set by the authorities. Sensors may measure force applied to the skin. This would enable policing of child care, preventing physical abuse for example. Alerts could be sent to authorities if the child is abused. Permanently imprinted display components may be developed that use the energy produced in this way to produce light or dark or even colours. These may emit light but may be simply patches of colour beneath the skin surface, which would be clearly visible under normal lighting. Inductive loops and capacitors may be used to power active components that can be imprinted or injected. Inductive loops can pick up electromagnetic energy from an external transmitter that may be in the vicinity or even worn as a detachable device. Such energy can be stored in capacitors. Detachable devices such as battery based power supplies may be worn that are electrically connected to devices at lower layers, either by thin wires or induction. Thermal energy may be obtained by using temperature difference between the body and the external environment. 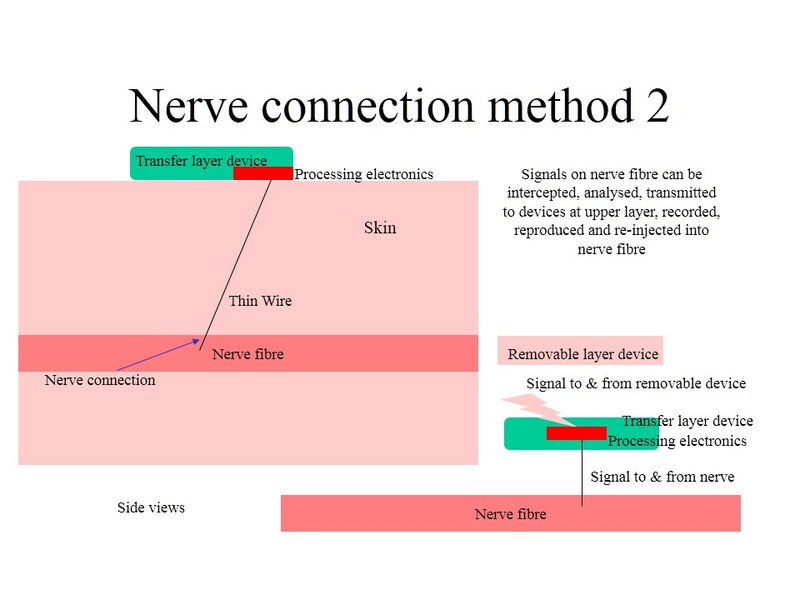 The temperature gradient within the skin itself may be insufficient for a thermocouple to produce enough voltage, so probes may be pushed further into body tissue to connect to tissue at the full body temperature. The probes would be thin wires inserted either directly through the surface, or by skin capsules*. Mechanical energy may also be used, harnessing body movement using conventional kinetic power production such as used in digital watches. Devices on the feet may also be used, but may be less desirable than other conventional alternatives. Some of the many devices in the layered active skin systems require communication with the outside world. Many of these require only very short distance communication, to a detachable device in contact with the skin, but others need to transmit some distance away from the body. Various implementations of communication device are possible for these purposes. Self organising algorithms may be used to determine which of an array of skin capsules are used for this purpose. Printed aerials may be worn as transfers or detachable devices. They may be electrically connected to devices directly or via high frequency transmission across the skin, or by local radio to other smaller aerials. · Various sampling, analysis, monitoring, processing, storage, and communication facilities may be added to an artificial tooth that may be inserted in place of a crown, filling, or false tooth. Powering may be by piezoelectric means using normal chewing as a power source, or for some purposes, small batteries may be used. · Infection monitoring may be implemented by monitoring chemical composition locally. Data may be stored in the tooth that allows interaction with external devices and systems. This could be a discrete security component, or it may hold personal medical records or a personal profile for an external system. Piezoelectric speakers could be used to make the tooth capable of audio-synthesis. This could allow some trivial novelty uses, but could later more usefully be used in conjunction with though recognition systems to allow people to talk who have lost their voice for medical reasons. Having the voice originate from the mouth would be a much more natural interface. Active skin components may be used to apply an electric field across a wound, which has been shown to accelerate healing. These would be imprinted or implanted at a health centre during treatment. Voltage can be produced by external battery or power supply, by solar cells at the detachable layer, or by thermocouples that have probes at different body depths as described above. The infection may be controlled by emission of electrical impulses and by secreting drugs or antibiotics into the area. This may be in conjunction with a detachable drug storage device, which can inject the drugs through skin conduits*. The monitors may be in communication with a health centre. Semi-permanent tags or ID patterns may be implanted in upper skin layers to allow short term electronically facilitated access to buildings. The tags are not easily removable in the short term, but will vanish over a period of time depending on the depth of penetration. They may photo-degrade, biodegrade or simply wear away with the skin over time. Babies can be secured against mistaken identification in hospital and their tags can interact with security systems to prevent their abduction. Proximity alerts could be activated when an unauthorised person approached them. Self-organisation of circuits has been demonstrated and is known widely. Active skin components with generic re-programmable circuitry may be installed and self-organisation used to configure the devices into useful circuits. 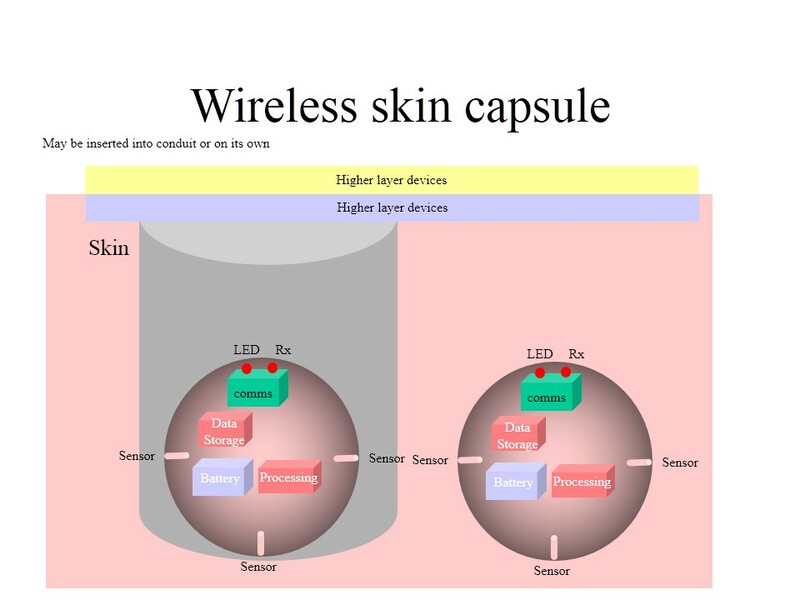 Combinations of display components may be linked by wires radiating out from each component to several other components, for instance by using skin capsules*. A self-organisation algorithm can be used to determine which connections are redundant and they can be withdrawn or severed. The remaining circuitry can be used as part of a control system to convert these individual display components into a co-ordinated display. This body adornment could be more functional, with informative displays built in for some medical purpose perhaps. Text warnings and alerts could indicate problems. Electrically sensitive chemicals would be useful components for such cosmetics. Many chemicals respond to electric fields and currents by changing their chemical bonding and hence optical properties. Some magnetic fluids are known that can be manipulated by magnetic fields. Active components may also be included that can change shape and hence their appearance, that are known in the field of digital ink. Characteristics of the appearance may depend on time of day, or location, or on the presence or properties of other environmental characteristics. Cosmetics may adapt in appearance depending on the presence of signals. These signals may originate from other people’s active skin or from environmental systems. People wearing such cosmetics could thus look different to different people. Also, corporate styles could be implemented , controlled by building signalling systems. The cosmetic manufacturer or a service provider may use such a digital mirror to provide the customer with an enhanced view of themselves with various options, co-ordinating the application of smart make-up by means of ‘make-up by numbers’, and controlling its precise properties after application. Active skin components that are clinic installed could be used to provide the positioning systems and intelligence for the upper layers of removable cosmetics. The customer would apply a quantity of makeup and then watch as various potential makeup effects are illustrated. On selection, that effect would be implemented, though several additional effects and contexts could be selected and assigned, and appropriate context effects implemented during the day. The effects could include the mechanical removal of wrinkles by means of actuators included in smart cosmetics*. Skin-based displays* may also form part of the overall effect. Medicines may be applied in a similar way under control by a clinic. Cosmetics may be controlled under license so that customers do not have unlimited freedom of appearance while wearing them. They may only be seen in a limited range of appearance combinations. Active Bindies, nose studs or other facial jewellery could be used as relatively deep implants to pick up reasonably good nerve signals from the brain as part of an EEG patch system*. These may be used to control apparatus via a signal recognition system. Signals from sensors in or on the skin can be used to pick up emotional cues, that are often manifested in changes in blood pressure, pulse rate, blood chemistry, skin resistivity and various muscular activity, some of which is subconsciously activated. Collecting and analysing such data permits a range of electronics that responds to emotional activity. The active bind is just one piece of jewellery that may be useful in this regard, and is limited by culture. Emotional messages may be sent that electronically trigger emotions in the recipient according to the intentions or emotions of the sender. Emotional email or voice messaging results. This enhances the capability and reach of communications dramatically. Positioning systems incorporating the fingertips by means of inductive loop tracking, motion detectors and dead reckoning systems, allow interaction with virtual objects. People could type in air, and feel physical feedback on interaction with objects, particularly useful in surgery using robotic tools. Links between people may be formed by linking sensors in one person’s joints to actuators in another person’s. This would be useful for training purposes. Vibrating membranes may be used as a signalling device. Vibration can be implemented via muscle wires or piezoelectric crystals in the detachable layer. These would allow personal signalling systems, ringing vibration, and development of synthetic senses*. An array of active skin devices may be arranged around the abdominal region of a pregnant woman, that would allow easy periodic ultrasonic monitoring of the baby during pregnancy. Some patches of active skin would house ultrasound generators, and others would house ultrasound receivers. The system is therefore capable of bathing the baby in a well defined ultrasound field for monitoring purposes. The patterns of reflections can be analysed by either processors in active skin or by a remote device, either worn or via the network, e.g. at a clinic. This produces images of the baby that can determine whether there is a problem. For instance, heartbeat and baby movements can easily be monitored. A simple microphone may be sufficient for just heartbeat monitoring if that is all that is needed. 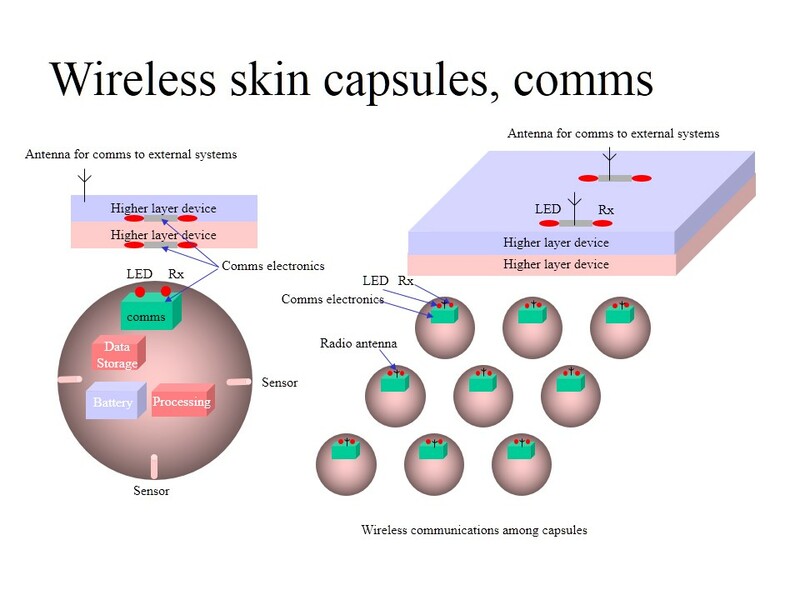 Ultrasonic communication to an external systems or another active skin device nearby. A region of active skin on the arm may be used as a data entry device such as a keyboard by means of adding positioning information such as digital paper patterns or other indication of location. Visible patterns on the arm could indicate where the letters or other keys are. This indication could be a simple ink pattern. With a virtual display, no components at all are actually required in the arm to implement the minimal system (similar systems already exist with purely virtual keyboards). Alternatively, in later generations of the devices, signals may be directly picked up from the nervous system and appropriate analysis used to determine the precise input. A system comprised of a range of such gauges and position sensors in various parts of the body may be used to gather a great deal of data about the movement of the body. This may be used extensively in training and correction applications by means of force feedback or sensory amplification. Force feedback or other actuator components* would give a signal or apply a force back to the body on detection of various parameter values. Movements may be precisely recorded and recreated via force feedback. Signal feedback systems may allow direct correction of such behaviours. See alarm systems. The means to directly associate a movement or behaviour with pain would be a valuable means of training and controlling animals or criminals. Such feedback may also be linked to emotional states to control aggression for example. A combination of movements, position or emotional state may be used to prohibit certain behaviours in certain locations. Strain gauges would be an important component of avatar based communication systems to allow the direct physical interaction of people across a network, whether a handshake or a hug or something more. Miniaturised circuitry will soon allow very small versions of many popular devices. These circuits may fit in a single skin capsule or be distributed across several capsules. Avatars will be an important communication tool in the near future. Avatars may be controlled manually or via video image interpretation, which is complex and invasive. Active skin presents an efficient means of accurately controlling avatars. 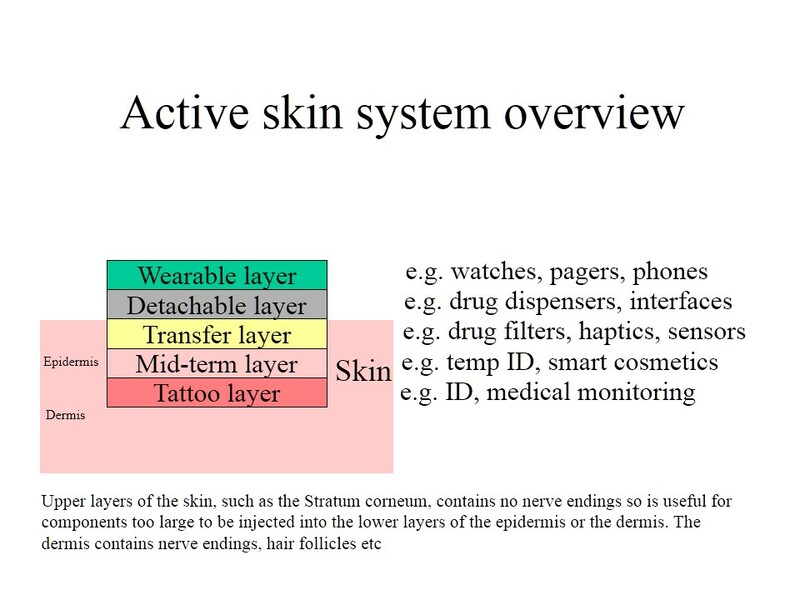 Sensors in skin at key parts of the body, e.g. finger joints, hands, wrists, elbows and face can be used to detect body movement and position. Interactions between avatars in virtual space are relayed back to the people involved via force feedback membranes, pressure transducers, smart fingerprints to convey texture, and direct nerve stimulation using nerve links. A highly sensory realistic communications link is thus established between the inhabitants of the virtual environment which is potentially far richer than that which may be obtained without the use of active skin or a full body suit. Instead of controlling avatars, the link may be used to directly control a robot. Sensors in the robot could be linked to senses in the human, allowing a high quality implementation of telepresence and teleaction. This would be very useful for surgery or for maintenance in hostile environments. It would also be useful for police or military use to control robots or androids in hostile environments. Surgical applications could be enhanced by filtering and pre-processing the body movements and possible translating them into a appropriate actions for robotic surgical apparatus. For example, large jerky hand movements may be converted into small smoother scalpel movements. An array of smart skin patches on the scalp could be arranged to collect electrical signals from the brain. Devices would signal using high frequency electrical signals or by ultrasound to other sensors or collectors or processors. Signals could be relayed to external apparatus by a single contact point or by means of radio aerials, LEDs or an active bindi. or may be used for thought recognition purposes, whereby pattern recognition technology is applied to analysis of the signals from the various sensors. Sensors need not only be on the scalp, but could be anywhere on the body, such as fingertips. Signals from the scalp may be used to control medical prostheses to assist disabled people. The intention to move an arm could result in the arm moving for example. Nerve signals for such applications may be detected on the scalp, or nearer to the prosthesis. Many of the applications discussed above would work well in harmony with active clothing, most of which is known technology. Active clothing already houses consumer electronics, reacts thermally and optically to the environment, monitors body activity, reports on injuries and casualty location, injects antibiotics, antiseptics and anaesthetics in case of battlefield injury. A wide variety of other ‘smart’ capabilities is also available off the shelf or in prototype. Drugs may be contained in external reservoirs or in skin capsules* or in patches e.g. nicotine patches. The rates of diffusion may be altered by means of active membranes or via skin conduits. devices in different people could be linked in this way, forming emotilinks. Groups of people could be linked. People belonging to several such groups might have different signalling or position for each group. Mid-term layer These components could be imprinted by printing onto the skin surface. Some could be implemented by adsorption from transfers, others by mechanical injection. Could be used to co-ordinate external device positioning accurately for medical reasons, e.g. acupuncture, TENS etc. Transfer layer This layer could use printing techniques straight onto the skin surface, or use transfers. A thin transfer membrane may stay in place for the duration of the required functionality, but could be removed relatively easily if necessary. It is envisaged that this membrane would be a thin polymer that acts as a carrier for the components as well as potentially shielding them from direct contact with the body or from the outside world. It could last for up to several days. actuators built into transfers could give force feedback. Transfer body suit, self-organising polymer coating. Use for sports etc. In May 2001, while working in BT research, I had an idea – how we could use the skin surface as a new platform for electronics. I grabbed a few of my colleagues – Robin Mannings, Dennis Johnston, Ian Neild, and Paul Bowman, and we shut ourselves in a room for a few hours to brainstorm it. We originally intended to patent some of the ideas, but they weren’t core business for a telecoms company like BT so that never happened. Now, 12.5 years on, it is too late to extract any value from a patent, but some of the technologies are starting to appear around the world as prototypes by various labs and companies, so it’s time is drawing near. We never did publish the ideas, though a few did make it out via various routes and I talk about active skin in my writings more generally. So I thought I’d serialise some of the ideas list now – there are lots. This one will just be the intro. Today we have implants in the body, and wearable devices such as watches and cell-phones in regular proximity to our bodies, with a much looser affiliation to other forms of electronics such as palmtops and other computers. With recent advances in miniaturisation, print technology and polymer based circuits, a new domain is now apparent but as yet unexploited, and offers enormous potential business for a nimble first-mover. The domain is the skin itself, where the body meets the rest of the world. We have called it active skin, and it has a wide range of potential applications. 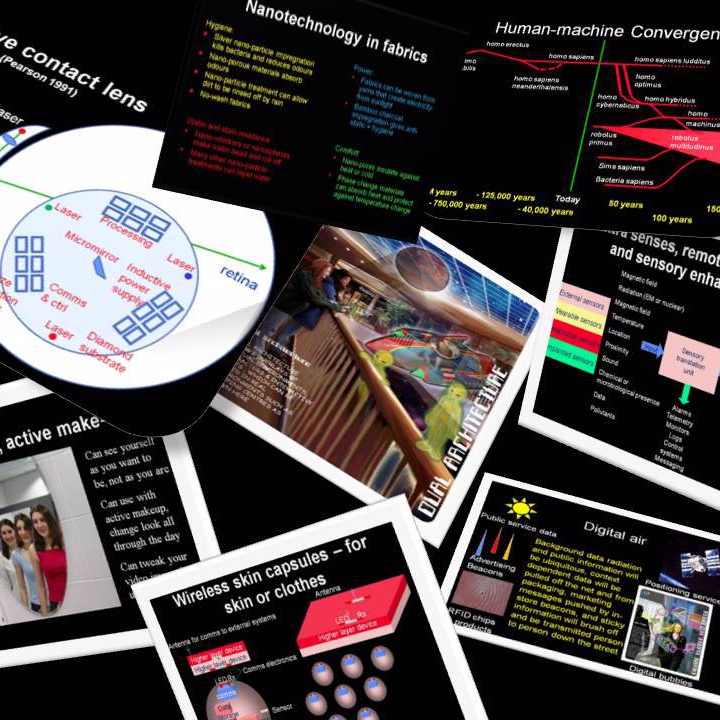 Stimulated by MIT work in late 1990s that has shown that the skin can be used as a communications medium, a logical progression is to consider what other uses it might be put to. What we proposed is a multi-layer range of devices. The innermost ‘tattoo layer’ is used for smart tattoos, which are permanently imprinted into the lower layers of the skin. These layers do not wear or wash away. The next ‘mid-term’ layer is the upper layers of the skin, which wear away gradually over time. Above this we move just outside to the ‘transfer layer’. Children frequently wear ‘tattoos’ that are actually just transfers that stick onto the skin surface, frequently on a thin polymer base. They are fairly robust against casual contact, but can be removed fairly easily. The final ‘detachable layer’ is occupied by fully removable devices that are only worn on a temporary basis, but which interact with the layers below. Above this is the ‘wearable layer; the domain of the normal everyday gadget such as a watch. A big advantage for this field is that space is not especially limited, so devices can be large in one or two dimensions. However, they must be flexible and very thin to be of use in this domain and be more comfortable than the useful alternatives.